What pops into your head when you hear the phrase affordable housing? Low-income households? Low-cost housing structures? Complicated homebuyer programs? Affordable housing programs have helped many families get on a path toward homeownership. Unfortunately, the mental images these words conjure harm the real estate market. It’s ironic because affordable housing professionals and programs have helped many families get on a path toward homeownership and wealth creation that benefits entire communities. But what if we flip those words and say housing affordability? Every homebuyer is looking for a home that’s affordable to them. That’s precisely the job of lenders — ensuring the home loan is affordable to the particular buyer. It makes homeownership sustainable. That’s precisely the job of lenders — ensuring the home loan is affordable to the particular buyer. My point here is that we should all care about housing affordability. Real estate professionals can be their buyers’ advocate by helping them find resources that make their purchase affordable to them. Let’s rethink affordability. Instead of the traditional measures of sales price and interest rates, what about the entry cost? The down payment is still the biggest hurdle, and the challenge is growing. I know. Who identifies themselves as potential beneficiaries of assistance? Our lexicon about affordable housing has made it difficult to have open discussions with buyers about their options. Consider this: Recent studies by RealtyTrac and Wells Fargo show that many potential homebuyers believe 20 percent down is required. Recent studies show that many potential homebuyers believe 20 percent down is required. Buyers continue to do more research before engaging real estate professionals, yet knowledge about mortgage products is decreasing. Unfortunately, the lack of discussion about what is affordable leads hundreds of thousands of eligible homebuyers to self-select themselves out of the marketplace. Money left on the table for buyers and real estate professionals. Home sales could quickly increase by 2-3 percent simply by demystifying and destigmatizing these opportunities. Home sales could quickly increase by 2-3 percent simply by demystifying opportunities. Homeownership programs come in all shapes and sizes and are designed to meet the housing needs of individual communities and buyers. There are ways to increase housing affordability for a much larger proportion of homebuyers — they include saving on a down payment and getting a lower interest rate and annual tax credit. 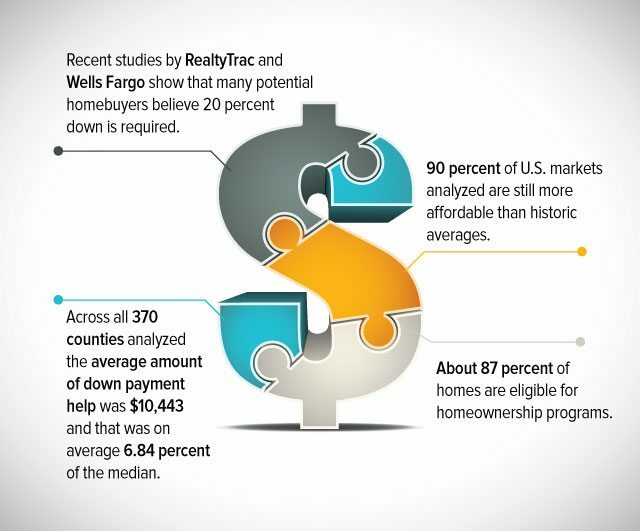 Our recent joint analysis with RealtyTrac on low down payment buyer affordability found that 90 percent of U.S. markets analyzed are still more affordable than historical averages. When ranking markets, we took into consideration the availability of down payment programs. Across all 370 counties analyzed, the average amount of down payment help was $10,443, and that was on average 6.84 percent of the median home sales price in April. That helps overcome an enormous hurdle for many buyers. Let’s tell millennials and boomerang buyers that about 87 percent of homes are eligible for homeownership programs. Maybe then, they will take the few minutes needed to find out if they are eligible and for how much. Let’s tell millennials and boomerang buyers that about 87 percent of homes are eligible. It might increase their housing affordability and get them into a home sooner than they, or their agent, thought. How do buyers find out? If they’re lucky, you know a lender who has invested the time and energy to be an expert in these programs. Maybe you even know which local housing counseling agencies offer help in your market. All it takes to find these resources is a quick search. Look for your state housing finance agency then click on their list of participating lenders and approved counseling agencies. Or, go to eHomeAmerica, NeighborWorks or Framework. They will educate and incubate as needed until your client is ready, willing and able. A little effort is all it takes to differentiate yourself in a hypercompetitive marketplace. You’ll build a career with rock-solid referrals, not to mention repeat sales and listings as your clients move up in the world. Rob Chrane is a former Realtor and broker with more than three decades of experience in real estate and mortgage finance. He is the president of Down Payment Resource.